I´m pretty happy with the road feeling. The ffb meter shows little forces even on straights, i feel them in my wheel and it even wobbles a bit when i take my hands away. "This parameter changes the way FFB output is filtered (how the forces increase when you turn the wheel…slower or faster than linearly). Defines how the steering feels (loose or sharp) in the center. Lower value will give you a sharp steering feeling but will introduce oscillations around center and you will lose details in forces. Higher values will give you a loose steering in center, but more details in forces." Note this is separate from steering rack which has its own way of making the wheel feel lose or tight in the centre. Did some more testing and i have to say the change from 1.0 to 0.75 of the FFB steer force exponent is a real game changer for me. I have a Fanatec CSR and because of it´s high mechanical resistance i use the Fanatec Drift Mode Setting on 2-3 to get a better feeling for weight transfer, details ect. With the FFB steer force exponent on 1.0 the mentioned FFB deadzone i had got more pronounced the higher i set the Drift mode. Beside of the FFB deadzone or because of it i always had the feeling that the steering/FFB in RR had a little bit lag to it when i compared RR with AMS back to back. Driving in AMS felt more direct/precise with a better feeling for the car so it was a bit easier for me to catch the car in AMS. This also got fixed for me with the lower steer force exponent. The SimBin FFB Guide exlained it on point: "Tip: to adjust this parameter, check wheel countersteering behavior...when you heavily oversteer and then the rear is brutally coming back and starts oversteering the other way....wheel should countersteer quickly"
The guide also mentions that a lower FFB steer force exponent will give you a less detailed FFB. With my old settings and the exponent value at 1.0 / Min Force at 10% some bumps on some tracks felt very sharp and spiky - sometimes a bit unrealistic/weird to me so i did a test session with the new settings at Zolder which is a very bumpy track and it feels surprisingly still as bumpy on 0.75 as with 1.0 but the bumps feel better / more realistic to me and my wheel still wobbles on the main straight when no other force beside bumps is applied. Btw: Has anyone ever tested the different FFB steer force balance mode settings or FFB steer force rear grip exponent at 0 ? "FFB steer force balance mode="0" // Mode for how to add the steering forces together (lateral, load and diff). Acceptable values: 0 = lat + load + diff, 1 = sqrt(lat^2 + load^2 + diff^2), 2 = sqrt(lat^2 + load^2) + diff, 3 = sqrt(lat^2 + (load + diff)^2), 4 = sqrt((lat + load)^2 + diff^2)"
"FFB steer force rear grip exponent="1.0" // Range 0.0 to infinity, recommended: around 1.0. Exponent applied to rear grip loss weight"
Some people recommend to change the FFB rear grip exponent to 0 since the steering is only attached to the front wheels. Isn`t it a pain when you have to throw your days schedule out the window and instead have to boot up raceroom and put in loads of laps. Yes it is dramatically but someone has to do it..
Well I tested your settings but I prefer mine. But I lowered the for e exponent to 0,75. Although I don’t know if I feel a difference with the standard 1.0. There must be something changed because the FFB stays neatly between the two lines now. No clipping anymore. There wasn’t much clipping but now it disappeared completely. I had some wonderful races in the Porche 911 GT3 GTM18 on Mid Ohio Full. 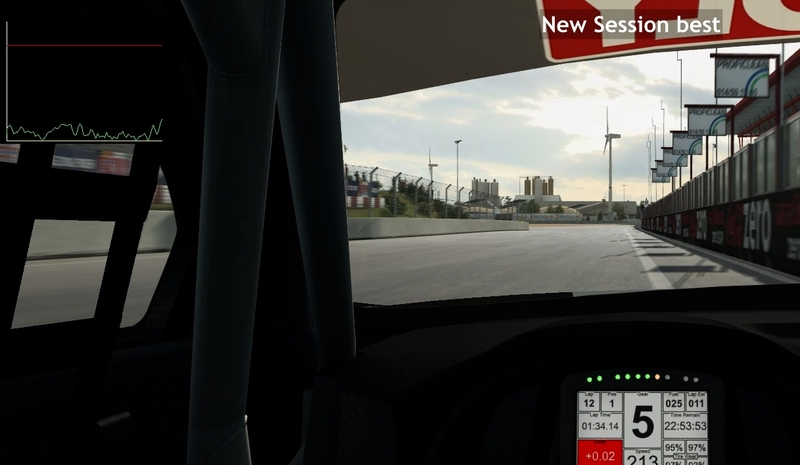 What a lovely track for the GT3 cars..
just tried a couple of my g25 settings on my current wheel, this was set to .5 which gave me the same rapid oscilation left n right, set to .75 its nots so bad but still not right .85 is probably about right for my current wheel. Where do I find the steering force exponent to change it ? Ok thanks. What exactly does that do? 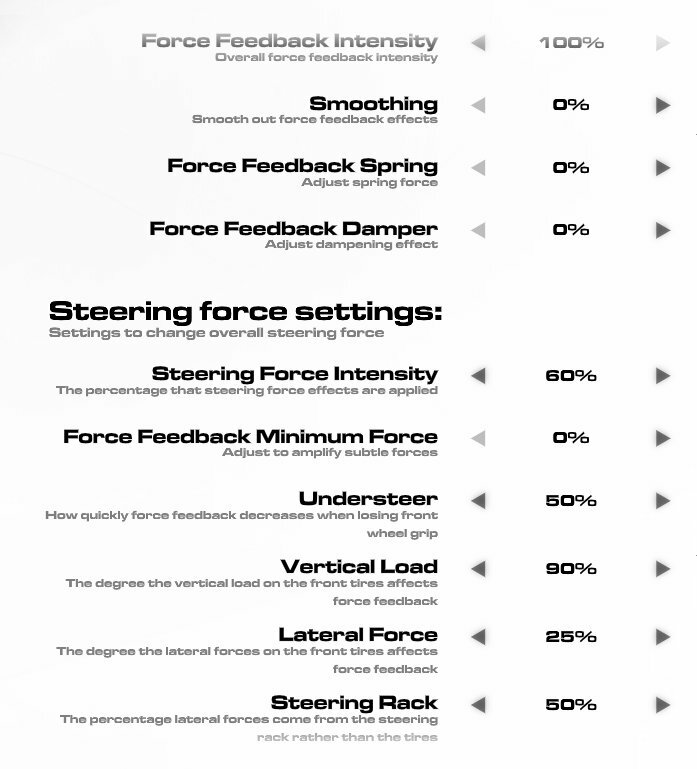 Higher values will give you a loose steering in center, but more details in forces. To adjust wheel behavior in center and change steering sensitivity, change "FFB steer force exponent. Lower value will give you a sharp steering feeling but will introduce oscillations around center like if a centering spring was used, and you will lose details in forces. Tip: to adjust this parameter, check wheel countersteering behavior...when you heavily oversteer and then the rear is brutally coming back and starts oversteering the other way....wheel should countersteer quickly. Lower the parameter until you are satisfied with wheel countersteering behavior in such situation. For information, default Simbin value is 0.75 and you should not go lower than 0.5 otherwise the wheel will oscillate violently around center." Do you mean the Player1.PLR file? How do you open that file? What program? It won't open in Notepad or Wordpad? Changed the described parameter to 0.75 from 1.0 and my CSL Elite PS4 doesn't feel well after that. Going back to 1.0 now. Yeah... I don't know what the problem is, but I can't open that file on any of my computers. It opens, but the content is scrambled, like a written in Windows Wing Dings or something. I've tried it on three different computers. The other files in that folder open fine, once I tell it to use Notepad. I even tried deleting it and letting the game build another. Same thing.